On last night's episode of UFC Tonight, UFC Fight Night 112 was announced for June 25 at the Chesapeake Arena in Oklahoma City. This will air on Fox Sports 1 in the US and TSN in Canada. 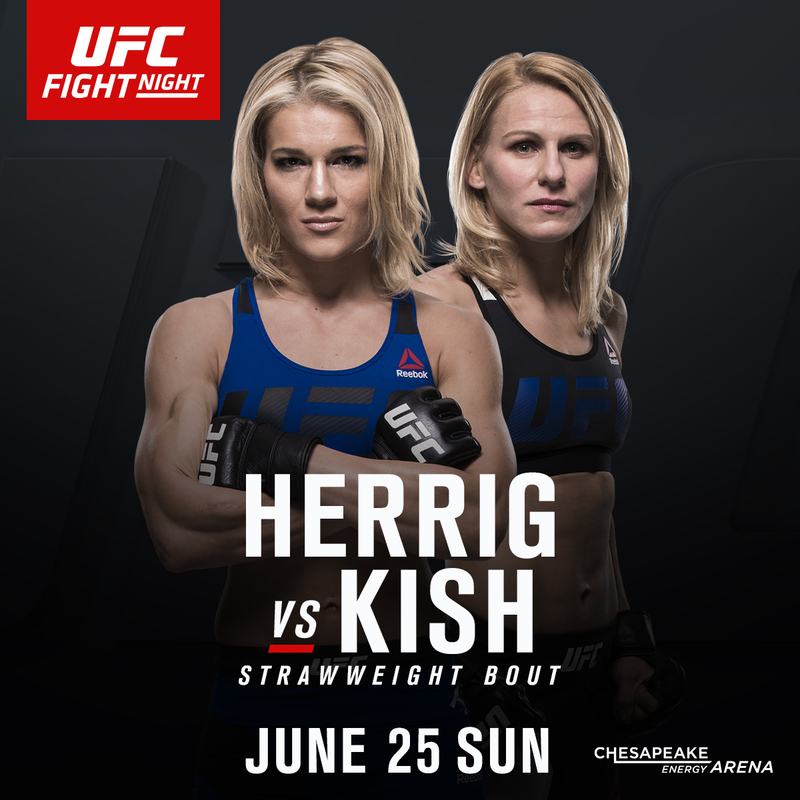 A Strawweight bout was announced with Felice Herrig vs Justine Kish. Felice got the biggest win of her career over the undefeated and highly touted Alexa Grasso on Feb. 4. Her record is 12-6 and she trains at Curran MMA in Chicago. One would think that Felice would like to face a higher ranked opponent so Justine seems like an odd choice. The only thing is Justine is undefeated at 6-0 and that might have convinced Felice to take the fight. Justine may be undefeated but there are questions about her. She was scratched from TUF 20 to have knee surgery. Upon her return, she got a decision win over Nina Ansaroff. It's a fight that some thought Nina won. Then on Dec. 9, Justine won a unanimous decision over TUF 23 alum Ashley Yoder. For one thing, Justine missed weight. And the fight was close. All three judges scored it 29-28. So maybe the UFC wants to find out how Justine does against a ranked opponent. Felice will be favoured so if Justine pulls off an upset, that's a big deal. So though the fight may not be what Felice was looking for, she took this possibly to keep busy. Justine trains at Black House MMA in Redondo Beach, CA. I thought it was a strange match when I heard about it last night. Now it makes a little more sense though I'm not sure how a close fight helps Felice. I will root hard for Felice, she is my home town woman. But it would not surprise me to see and upset in this fight. I am guessing it may happen. AccuRadio Song Of The Day-Louis C.K.